Written by Philip M. Burger, P.E. Phil Burger is the founder of Burger & Brown Engineering, Inc. in Grandview, MO and currently serves as Director of Product Development. Technical molders know that turbulent cooling flow can improve cycle times and help the bottom line. Here are some factors that can inhibit good cooling and also some thoughts on how you can improve your mold cooling results. As flow velocity increases to a critical speed in cooling channels, the flow begins to swirl and mix vigorously. This condition is known as turbulent flow. Turbulence increases heat transfer by virtue of the mixing and faster flow at the boundaries of the coolant and steel. Turbulent flow may be predicted with a simple calculation to determine a Reynolds number. This simply says that the larger the pipe and the higher the kinematic viscosity, the more flow you need for turbulence. Kinematic viscosity is the English unit of viscosity (ft.²/sec.). Using this expression, Burger & Brown Engineering developed the following Turbulent Flow Reference Chart. It has been provided to the industry free of charge for many years. It is important to realize that kinematic viscosity of the coolant increases significantly as the temperature decreases. Add some antifreeze and the viscosity increase becomes dramatic. Figure 1 shows the effects of both temperature and ethylene glycol (a common antifreeze compound) on kinematic viscosity. Consider this example. For a ½" dia. flow passage in a mold with water at 60°F, it takes about .5 GPM to get turbulent flow. But what if you are using a coolant of 30% ethylene glycol in water at 40°F? Figure 2 shows that you now need a flow rate of around 2.4 times greater or about 1.2 GPM to get turbulent flow in a single cooling circuit. Now, imagine that you have a dozen cooling connections on an average mold and your plant has 24 molding machines. You can begin to see the implications. Another property of antifreeze compounds that should be considered is their lower specific heat capacity. The specific heat capacity is the amount of heat required to change a unit mass of a substance by one degree in temperature. Think of specific heat as the capacity of a substance to hold or carry heat. Ethylene and propylene glycol have slightly less than 60% of the heat capacity of water. A solution of 30% ethylene glycol in water will have about 90% of the heat carrying capacity of water. It is easy to assume that colder is better for mold cooling fluid. But to run coolant at 45°F or lower you must add glycol to the water to prevent evaporator coil freezing in the chiller. That means you will need more than double the flow to get turbulent conditions. Taken on a plant wide basis, this can tax the available coolant pumping capacity. If pumping capacity is limited are you better off with 100% water at a higher temperature, requiring less than half the flow to be turbulent? Low temperature coolant (requiring antifreeze) costs extra in several ways. First, there is the cost of the antifreeze and the ongoing cost to replenish it as makeup coolant is added. Next, there is the additional operating cost of refrigerating to lower temperatures. There are capital and operating costs associated with the additional pumping capacity needed for the more viscous coolant. Other costs can result from degraded part quality associated with very cold, sweaty molds. Ethylene glycol is toxic and also poses a health and an environmental risk in the event of a serious spill. We performed a real world experiment in our in-house molding department to demonstrate measurable effects of antifreeze solution vs. water coolant. We used a small 8 cavity mold that makes a polypropylene nut. We installed a thermocouple in the cavity plate to sense the steel temperature near the cavities. We started the mold with 100% water circulating at 60°F at a flow rate sufficient for turbulence. After an hour of running, the steel temperature stabilized at 78°F. We stopped the machine and added glycol to the chiller to a concentration of about 40%. We restarted the mold at the same coolant flow rate and temperature. As the process stabilized, the steel temperature rose to 83°F. Molded part temperatures were running around 8 degrees warmer than with water cooling. This clearly indicates a reduction of cooling capacity caused by the combination of increased viscosity and reduced heat capacity of the coolant. Microbiological Issues – Microbiological Influenced Corrosion (MIC) is caused by the corrosive effects of microbiological growth on metal components. Fouling of heat transfer surfaces can occur. The combined results are restriction of coolant flow and dramatically reduced heat transfer coefficient. Scaling – Minerals can precipitate out of water and deposit onto heat transfer surfaces, restricting coolant flow and reducing heat transfer. Corrosion – Undesirable water chemistry can attack metal components of the system. MIC, mentioned earlier, is one type of corrosion. Galvanic Corrosion can occur from electrical interaction of different metals with the coolant. The use of ethylene or propylene glycol complicates the water treatment process. Glycols are known to make the water more corrosive. Some glycols have corrosion inhibitor packages added to them. The question is, “Are they right for the specific metal components of your system?” Low levels of glycol can encourage microbiological growth in the system water. Water treatment issues are unique to each system due to the chemistry of the local water supply and individual plant conditions. The Association of Water Technologies is a professional association dedicated to the water treatment industry. They provide training and technical information and can assist you in reaching a local water treatment professional. They can be contacted at www.wta.org for more information. I have argued before that improving mold cooling is the “low hanging fruit” in improving profits. Take the time to know how much flow you need for turbulence and measure the flow in each cooling circuit. Establish minimum flow rates for all cooling circuits and incorporate this information into setup sheets. Simple, affordable tools for turbulent flow measurement and flow regulation are readily available from molding supply distributors like IMS Company and DME Molding Supplies. Also, you can visit our website at www.smartflow-usa.com and click on technical documents for previously published trade articles and for free downloads to assist in your quest for process improvement. 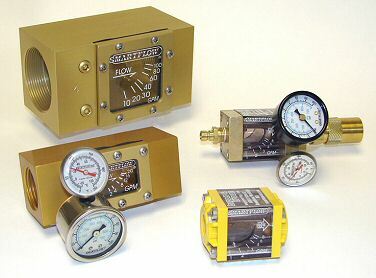 Burger & Brown Engineering, Inc. offers the following range of products for measuring flow rates in cooling circuits. 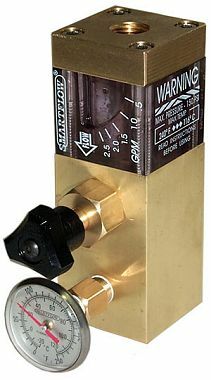 SMARTFLOW® Mechanical Flowmeters are offered in many sizes and flow capacities to use with individual cooling circuits or on larger supply piping.